Guillermina Jasso is Silver Professor and Professor of Sociology at New York University. Professor Jasso received her Ph.D. in sociology from Johns Hopkins University in 1974. She was the founding director of the Methods Workshop at New York University (1991-1997) and the founding director of the Theory Workshop at the University of Iowa (1988-1991), as well as a co-founder of the Life Course Center at the University of Minnesota. She served as Special Assistant to the Commissioner of the U.S. Immigration and Naturalization Service (1977-1979) and as Director of Research for the U.S. Select Commission on Immigration and Refugee Policy (1979-1980). Professor Jasso has written extensively on basic sociobehavioral theory, distributive justice, status, international migration, inequality, probability distributions, mathematical methods for theoretical analysis, and factorial survey methods for empirical analysis. She has published widely in scholarly journals, including two articles which recently won awards from the Population Section of the American Sociological Association and the Law and Society Association. She has also co-authored a book on U.S. immigration, The New Chosen People: Immigrants in the United States, with Mark R. Rosenzweig (Russell Sage, 1990). Currently she is a Principal Investigator of the New Immigrant Survey, the first national longitudinal survey of immigrants in the United States. Professor Jasso was elected to the Johns Hopkins Society of Scholars and to the Sociological Research Association, and was elected a Fellow of the American Association for the Advancement of Science. She was a Fellow at the Center for Advanced Study in the Behavioral Sciences (1999-2000), is a Research Associate at the Hobby Center for Public Policy at the University of Houston and a Research Fellow at IZA Bonn, and is also a Fellow at the Stanford Center on Poverty and Inequality. Professor Jasso has served on many advisory boards, including panels advising the National Science Foundation, the National Institutes of Health, and the International Institute for Applied Systems Analysis, and currently serves on the Scientific Advisory Board of DIW Berlin (Deutsches Institut für Wirtschaftsforschung -- German Institute for Economic Research), the Survey Committee for the German SocioEconomic Panel, the Academic Advisory Council of the Berlin Graduate School of Social Sciences at Humboldt University, and the U.S. Census Scientific Advisory Committee, of which she is Chair. She was a member of the National Academy of Sciences' Panel on the Demographic and Economic Consequences of Immigration, the Core Research Group of the Binational Study of Migration Between Mexico and the United States, and the National Academy of Sciences' Committee on Redesign of the U.S. Naturalization Test. She has served as Deputy Editor of American Sociological Review. 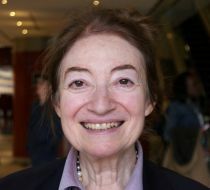 She has also served as Chair of four Sections of the American Sociological Association -- the Theory Section, the Rationality and Society Section, the International Migration Section, and the Social Psychology Section -- and currently serves as Chair of the ASA Methodology Section and President of the Research Committee 42 on Social Psychology of the International Sociological Association. Professor Jasso's Erdős number is 3. Guillermina Jasso joined CReAM as an external fellow in July 2013.